Summer is prime time for ticks. These tiny arachnids, relatives of spiders and mites, are exoparasites, living outside their hosts, supporting themselves by feeding on their hosts' blood ... until something or someone removes them. Ticks bore a tiny hole in the skin, squirt an anticoagulant chemical into the wound to keep the blood flowing, and feed until something or someone removes them. 3. Wear light or white clothes when outside. Lighter colors make it easier to see ticks on your clothes before they burrow into your skin. 4. Wear hat when outdoors. 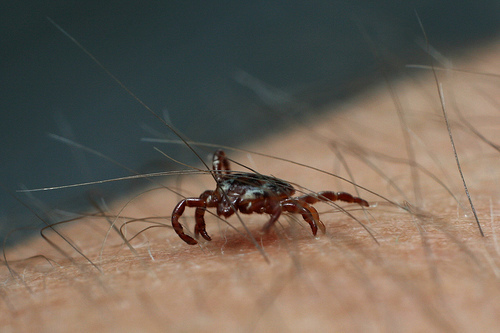 This will keep ticks out of your hair and off your scalp. 5. Keep your pets tick-free, especially cats, who are more quickly sickened by tick-borne infections. 6. Walk down the center of a trail. Don't walk through tall grass wearing walking shorts, tank tops, or flip flops. 7. Clear brush and leaves away from your home. Don't pile leaves in the yard in the fall. Compost or burn them, and be sure to wear protective clothing around your compost pile. 8. Place a blanket or tarp on the ground when you picnic in the woods, or sit on stone. 9. Check your clothes when you remove them for ticks. It is possible for a tick to survive cold-water laundry and attach itself to you the next time you wear the item of clothing. Ticks are mostly likely to hide in creases or folds of clothing. 10. Pay special attention to hairy areas of your body after you have been outdoors. Make sure you don't bring any ticks home with you in your hair on any part of your body. If you follow them carefully, you don't need to use DEET (which is applied to either skin or clothing) or permethrin (which is only safe on clothing). You don't need to spray your property with acaricide pesticides to kill ticks which are only replaced when animals wander onto your property. But if you are bitten by a tick, you need to remove it carefully so it does not squirt even more infection-laden blood and saliva into the wound. 1. Remove ticks as soon as possible to minimize infection. 2. Never squeeze a tick with your fingers, since this can force your blood and the tick's stomach contents into your wound. 3. Never remove a tick with nail polish remover, turpentine, or any other solvent, because this can cause the tick to vomit into the wound on your skin. 4. Remove a tick with tweezers. Place the tips of the tweezers at the sides of the tick, and pull upward with a minimum of pressure. If you spend a lot of time outdoors, invest in a tool called "tick nipper". This patented device has long plastic edges with a cupped end that are much less likely to break off the tick's beak in your skin or to force blood or stomach contents into the wound. It also comes with a 20X magnifying lens that allows you to identify the tick so you can describe it to the doctor later if you develop symptoms. January W. Payne, "3 Tips for Avoiding Tick Bites and Lyme Disease," US News and World Report, 30 June 2008. DIY tick removal goes wrong? Wound not healing after hemorrhoidectomy. Can cold weather cause burn wound and how?